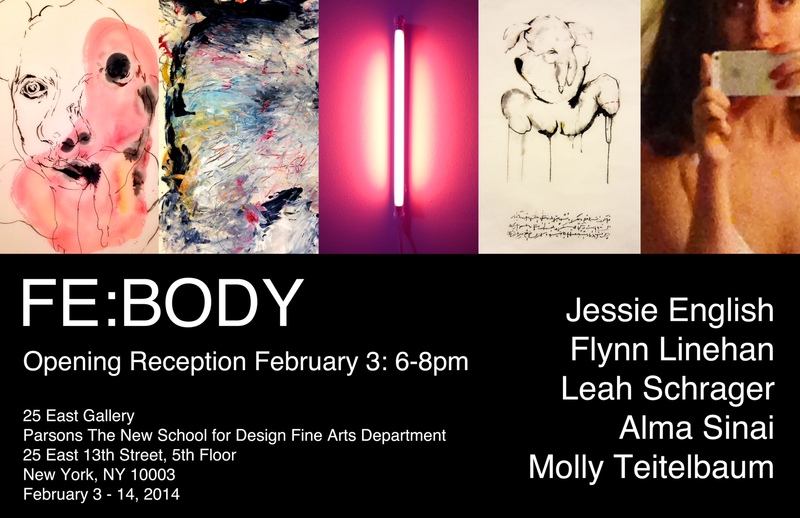 FE:BODY reconsiders the female body (and its relationships to other bodies) through a multimedia presentation of artwork by Jessie English, Flynn Linehan, Leah Schrager, Alma Sinai, and Molly Teitelbaum. We explore the continuum from “trick” to genuine, psychological to physical, and artificial to real. Ultimately the works are about what it is to be female, conflicted, and thriving in the (often dis-embodying) 21st century. The “FE” in FE:BODY is a reference to “female,” “iron” (a metal in the first transition series), and to “Re:” as in the response subject line of an email. These works explore the ways in which being and presenting women is strong, transitional, and (anti-)technological in our current lived experiences through our recent (and developing) artworks.